TUCSON, Ariz., 13 April 2015 – Utah is known as a place of contrasts, from the rustic landscapes of its National Parks and Monuments to the modern city environment of one of the fastest-growing urban areas in the United States. With the rapid growth of its cities, parts of Utah are losing the dark night skies that once characterized frontier life in the Beehive State. In an effort to save this vanishing resource, local residents came together to preserve the night sky. Thanks to their years of dedication, the International Dark-Sky Association (IDA) now recognizes Weber County North Fork Park as the world’s first Bronze-tier International Dark Sky Park. North Fork Park is only the second county park in the world to receive the prestigious Dark Sky Park designation. Weber County North Fork Park is situated on 1,000 hectares (2,470 acres) of mountain valley land in Utah’s Wasatch Range north of the Ogden area. The Park is located within about two hours’ travel from most communities in the Wasatch Front, a five-county area home to some 80 percent of Utah’s total population. Jennifer Graham, Director of Weber County Parks, agreed. “Weber County residents have always known that North Fork Park was a special place. 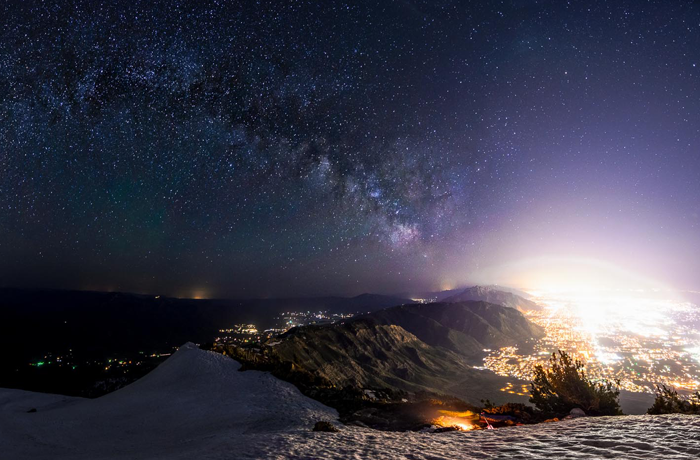 The long term benefits of being a Dark Sky Park will assure that the park continues to be the rustic refuge for so many along the Wasatch Front,” Graham said. The proximity of the Park to the urban centers of the Wasatch Front is both its most significant threat and its greatest opportunity. The mountains of the Wasatch Range help screen out the lights of Salt Lake City and the Ogden valley, but the Park has done much to improve lighting conditions in and around the park to enhance the visitor experience at night. Janet Muir of Ogden, who led the effort to secure the Park’s IDA certification, hopes that today’s announcement is the start of a dark-skies movement across northern Utah. “North Fork Park can be said to be the northern anchor for the largest concentration of designated and aspiring International Dark Sky Parks in the world,” Muir said. International Dark Sky Park status for North Fork Park is the result of many groups working together including Weber County Parks, the Ogden Valley Chapter of IDA, Weber State University and the Ogden Astronomical Society. Collaborators identified four themes as the main features of the Park: its location near a major urban center, an intense focus on wildlife, extensive outreach programs, and innovative public art that incorporates dark skies themes. The IDA designation is the culmination of a lengthy process that has seen a series of previous successes, including the enactment of Utah’s first county-level dark sky ordinance in 2007. In the spring of 2013, the IDA Chapter undertook a series of meetings with local businesses seeking voluntary compliance with both the lighting and signage ordinances, resulting in growing awareness and a significant number of improvements and lighting retrofits. A number of education and celebratory events are planned leading up to a formal celebration at Weber State University on October 21. IDA established the International Dark Sky Places conservation program in 2001 to recognize excellent stewardship of the night sky. Designations are based on stringent outdoor lighting standards and innovative community outreach. Since the program began, 10 Communities, 21 Parks and nine Reserves have received International Dark Sky designations.